A welder as a birthday present? What was her husband thinking! This turned out to be a significant gift. 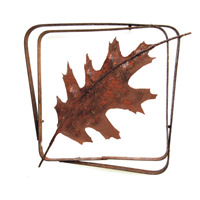 It set the new creative course for the couple, who now work at their studio on the family farm, producing metal accents for home and garden. Add some stainless steel jewelry, serving utensils and wood/metal furniture, and you have Metallic Evolution! Buy more, save more! Place an order $500 or more at the AH 2019 show, mention this listing and we will split the shipping cost with you. 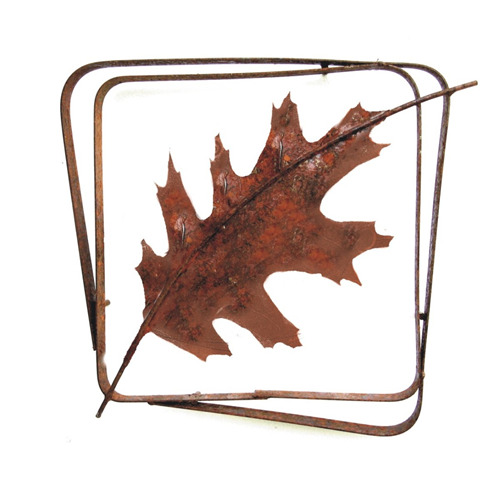 A rustic leaf silhouette with hand cut and hammered details, 13 designs available in two sizes, approx. 13" sq and 20" square. 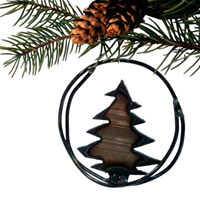 These rustic ornaments are a newer addition to our line and already a best selling favorite. The rings are all individually hand bent from dark steel wire, approx. 3" in diameter. Ten different designs are available including this tree silhouette, and other holiday-themed designs like stars, holly, angel, pointsetta, bell, cross, candle and a turtle dove. Designed to hang from an ornament hook on the tree or from a piece of filement line in a window. We make this desk clock of steel, brightly sanding all sides of the sails and base so it is attractive from every angle. Simple time markings in the way of small holes are on the face. 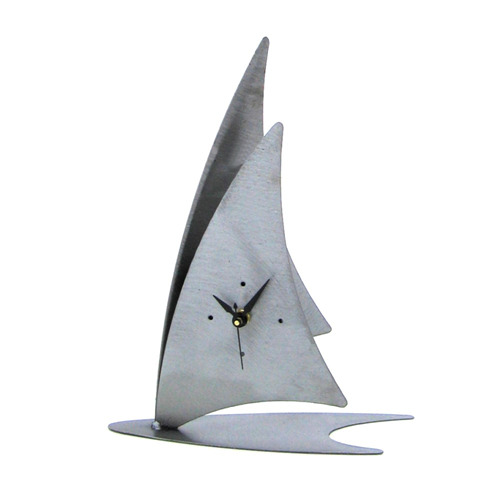 The clock mechanizm is AA battery operated and hidden between the two sails. This clock stands approximately 12" tall. Brightly polished stainless steel and a unique contemporary design are what sets this salad set appart. We create and weld together all the parts in-house to ensure quality. The high quality stainless steel used, mean that these are as hard working as they are beautiful. Dishwasher safe and ready to elevate your dining experience. Approx. 13" long. 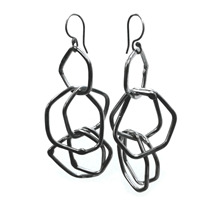 Truely Charming, these earrings offer a lot of movement and design with very little weight. We individually forge the hex-shaped rings then welde them all together. 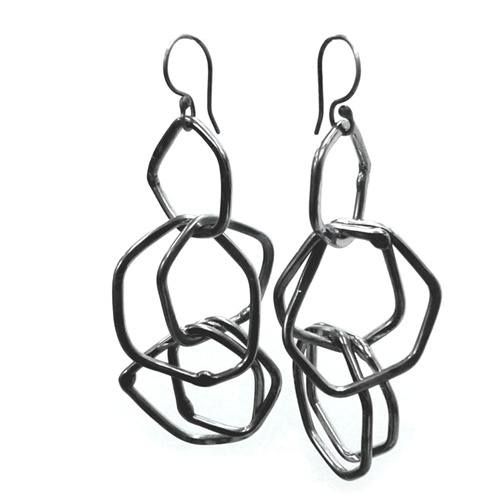 The earwire is sterling silver that we oxidize to match the coloring of the stainless steel better. 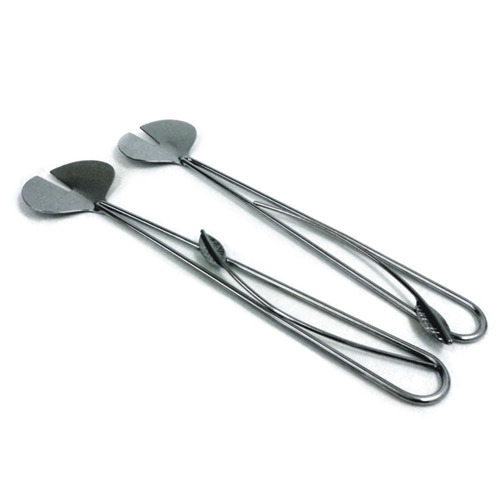 That also means the entire earring is virtually maintenance-free, no polishing required. Approx. 2" long drop. In this design we combine our skills in two mediums: The solid steel base is made of heat-darkened square tube and wooden support rail. 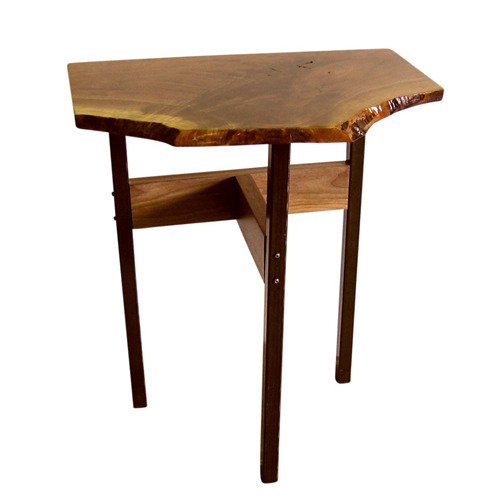 The top is a live-edge solid wood slab. John mills all his own lumber, carefully air drying it for years before finishing it into these furniture pieces. 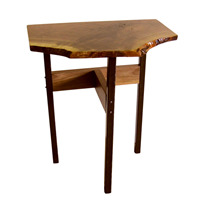 The result is exquisite wood detailing combined with carefull wood handling for a table that will last generations. We make the bases the same, but as each piece of wood it unique, the tops can vary in size and design. Each table is 22" tall, and the tops are an average of 24" long by 12" deep. Contact us for images of current wood slabs available.